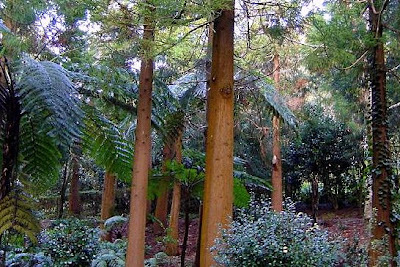 In São Jorge Island we can see the many shades of cool green of the pastures inhabited by plump spotted cows, the spots of blue hydrangeas and heather in the fields. The dense clusters of ferns which, mixed with arum lilies and belladonnas - the latter affectionately called "girls go to school", in some islands of the archipelago since they bloom at the start of the school year - cover the slopes. Here and there oaks, beeches, pines and eucalyptus are mixed with the remains of the laurissilva forest that covered the island before it was settled, a valuable relic of the vegetation that existed in southern Europe and North Africa over 15 million years ago. This is the natural setting that São Jorge offers for the most exciting views, to which the crystal blue ocean lends its tones and its frame made up of foam dashing against the steep cliffs along the coast. Originating in the collapse of cliffs, the fajãs are flat areas that stretch along the coast. All of them have been converted into fertile orchards, into fields where yams, maize and vegetables are grown. Due to micro-climates, it is possible to grow coffee, vineyards, tropical fruits and beautiful dragon trees in some of them. There are fajãs on both sides of the island. On the lower, sunnier southern coast, you will find the fajãs of Velas, Santo Amaro, Almas, Grande, Vimes, Bodes, Além, São João, Cardoso and Alabaçal. The north is a succession of tiny fajãs at the bottom of ravines that are hundreds of metres deep; the outstanding ones are those of Caldeira de Santo Cristo (with an underwater cave and a lake from which delicious cockles are obtained - the only ones in the Azores), Cubres (also with a crystalline lake) and Ouvidor (the limiting rocks of which have been made lace-like by the ocean). An area that corresponds to the most recent part of the island which is geologically the product of three important volcanic eruptions spaced out ever thousands of years, of which the "welding" can be seen in the fractures that interrupt the landscape to the east and to the west. 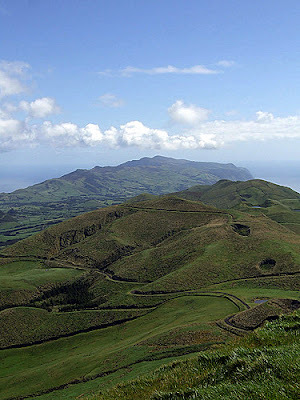 It is made up of small volcanic cones of which the highest - Pico da Esperança, with an altitude of 1,067 metres - offers views that take in the nearest islands: Faial, Pico, Graciosa and Terceira. Slightly to the north of the picturesque parish of Topo lies a verdant islet where cattle graze, brought to and from the pastures by boat. Off the western tip of the island lies Rosais islet, an inhospitable rock inhabited only by sea-birds. The waves have hollowed out the hard lava, creating natural bridges and arches along the coast. The most interesting are situated at Velas and.in the fajã of Santo Amaro. Walking along the coast near Urzelina, you can reach Furna das Pombas, a curious volcanic formation inhabited by wild pigeons. Algar do Montoso, situated on the peak of the same name, requires experience and equipment. They begin as tricles of water. But they soon gain momentum and when they reach the cleavage lines of the crest of the island they often turn into striking waterfalls that leap tens or hundreds of metres until they reach the sea. Sete Fontes in the Parish of Rosais and Silveira at Ribeira Seca display the most beautiful things nature can offer in the spring and summer.